Taitlyn is using Smore newsletters to spread the word online. Kids Working just to be Feed! In the 1910's children are working for too long of hours when they are too young. With working so many hours kids get tired too fast and they don't have time or energy for school. Children are needing to work because there parents can't earn enough money for their family. The kids also have to work enable to get money for food and proper medication when they are sick. The employers like to hire kids because they work for less money for more time. They also like it because than the companies gain more money for having more product made for lower wages. This needs to be changed because kids are not getting enough education to do their job right and some kids are getting sick and injured because of the job. 1.7 million kids were working in the 1910's and out of all the workers, 18% were under age 16. Many kids worked in the coal mines and inhaled a lot of dust which can damage there lings and cause great illnesses. After a long hard day at work some kids would go to night school. When they went to school the kids would be too tired to focus. The children worked 72 hours a week, about 14-16 hours a day. One out of five kids in the ages 10-15 worked a long, hard day just to get under paid at the end of the day, 50-60 cents on a good day. Eventually child labor was solved. 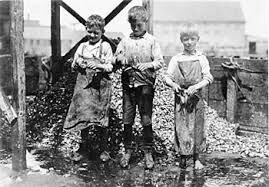 When Congress first passed an act for child labor they took the act away because they thought it as unconstitutional. After the Great Depression Congress pass the Fare Labor Standards Act in 1938. That Act stated the minimum wage, the maximum hours a child could work, where and what kids can do so they don't get injured, and more regulations to stop child labor.